At the Mary Diana Samuel Trust in Thiruvallur, India, not all are orphans. Some have eight or nine older siblings. The older sisters were being married off, and there was no money left for food or education – remnants of a live though abolished dowry system in India. Some had only one parent remaining or a parent with disabilities. Even if they were not on the streets, until now all were hungry, none in school. Their last names are now Samuel and they belong here. 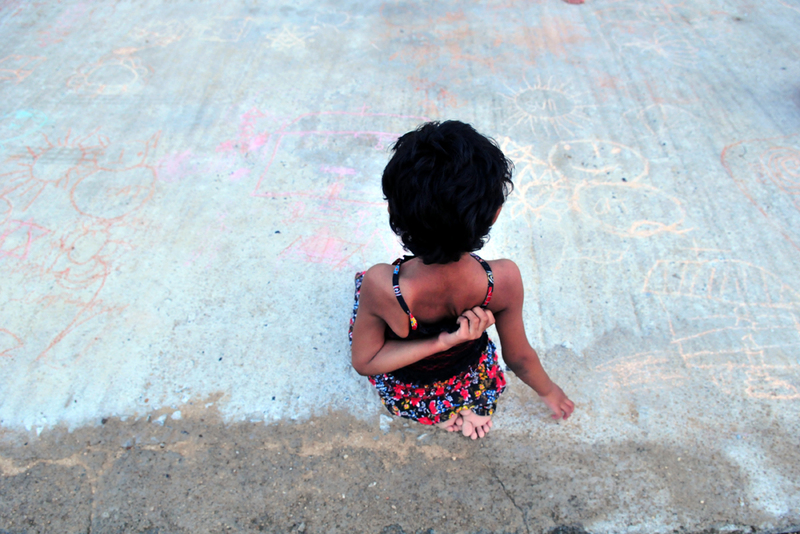 Lydia Samuel, 5, scratches a rash spread across her back while outside the orphanage as she admires her work. The girls were outside drawing pictures with chalk on the sidewalks at dusk, after the midday heat and sun abated. In the morning and evenings of this summer vacation, there is Bible study. Verses memorized from John, Samuel, 1 Corinthians – the love chapter. Songs with dances to accompany them echo through the corridor. Grace, 7, far, left, Donna, 11, Kalairsi, 5, and Florence, 7, stand and recite the "Our Father" prayer before beginning their lessons in the morning. The girls are in classes through most of the day, though they are on vacation from school. Education is valued highly for these girls who will have to support themselves in a society built on multi-generational households. Now labelled as orphans, the girls have no prospects of marriage within their traditional society. Maria, 9, left, Jannan, 8, and Karen, 11, take notes and discuss during an English lesson. Inside the orphanage to escape the midday heat, the focus is language. English, Hindi and Tamil, the Tamil Nadu state language, are in constant rotation throughout the year. Snaha, 5, repeats a Tamil lesson with direction from caretaker Malar Selve Thangaraj. After morning Bible study, the children play games and learn music together in the shade of the outer hallway. There is constant giggling along the hallway. Thirty-five sisters in one space. They fill in every available gap – knees touching, arms stretched across the others. It is a sea of fidgeting, adjusting, fixing the hair, necklace, fasteners on the closest girl. Priya, 3, left, leans in to whisper to Sarah, 6, while waiting for their turn to play a musical instrument. Cynthia, 10, Nalini, 9, and Paul, 11, wash their dishes after lunch at the orphanage, with help from caretake Malar Selve Thangaraj. There are three meals a day with vegetables and sometimes meat, a luxury the children had not had prior. Of the 37 charges, only two are boys, siblings of girls who are are truly orphans. Daughters are still beholden to India's dowry system and easier to discard as sons bring in money to the family. The playground is sheer chaos. Shalini, 12, yells across to the other slide as she is pushed up the stairs. Once the caretakers turn their backs, the decibels increase. Running, pushing, tickling and yelling, the social life of the girls comes rushing out past their polite classroom manner. The older ones are responsible for the younger ones. They spend hours each day as guides through bath time, meals, bed, and prayer. With only a single couple running the orphanage, there are few hands to care for the 37 charges. Responsibilities are delegated in as many ways. Andhi, 5, right, waits in the doorway for a bath. Julie, 11, far left, acts as an older sister to the room of girls, washing 5-year-old Lydia's hair with cold water. Mercy Samuel, 7, sits outside the orphanage drawing with sidewalk chalk after an afternoon thunderstorm. She says she does not miss the older sister and four younger brothers she left behind, nor her single mother whose profession as a nanny did not provide enough food. Though she will be unmarried and on the fringes of this traditional society in many ways, Mercy now has the support that allows these girls to dream of a future. They says they want to be doctors, nurses, engineers or perhaps even flight attendants, professions to which they would not otherwise aspire as the daughters of house servants and grass cutters.